This weekend, I had the opportunity to visit Cavalry Brewing in Oxford Connecticut. Cavalry is owned and operated by Mike McCreary, a veteran and victim of the Great Recession of 2008-10. When Mike’s company downsized a couple years ago, he took the opportunity to travel to England and learn how to make beer. The result is Cavalry Brewing: a traditional brewery focused on making excellent examples of English style ales. Mike focuses heavily on his military background: every beer is named after someone he served with in Iraq, and he even hangs a huge American flag in the brewery “to piss off the liberals.” His dog “Mash” (I suppose that could be a double entendre, given his military background…) protects the brewery from small rodents and other intruders, while greeting visitors with a lively yap. Cavalry currently offers four beers, all of which are made in the traditional English style — three recipes are Mike’s own, while the fourth is from a friend over in England. 1. Hatch Plug Ale, a pale English Ale named after a portly soldier who was traded to another unit for 6 M-16’s. 4.5% alcohol and 28 IBU’s. This is a delicious and clean tasting pale ale that will be popular with those who like to drink more than one beer in a sitting (ahem). 2. Dog Soldier Ale, an English session ale in the classic sense, this bitter weighs in at just 4.0% alcohol and 28 IBU’s. Highly drinkable, Dog Soldier has an unassuming bitter flavor that doesn’t overwhelm. A session beer indeed. 3. 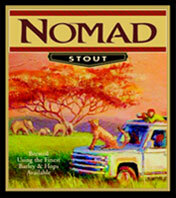 Nomad Stout, a dry Irish stout named after the leader of Nomad company. 4.5 ABV and 50 IBU’s, this stout is fantastic. The roasted flavor really comes through, and makes this a smooth and delicious drink – a highly drinkable stout. Not super light, but sweet and dry. 4. Big Wally Porter, named after Mike’s squad commander. At 4.8% ABV and 40 IBU’s it might seem that this beer is underwhelming, but don’t be deceived. 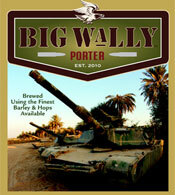 Big Wally is reminiscent of Otter Creek’s Stovepipe Porter (one of my all time favorite examples). I went home with a growler of this and enjoyed it for the next couple days. Absolutely my favorite of the bunch, with coffee and chocolate aromas (his words) that really come through. Definitely worth buying if you can find it. These are Cavalry’s only four products, although Mike has an IPA in the works, and I had a chance to try this one fresh from the fermenter. Although it wasn’t done yet, you could tell it had the character of a fantastic traditional English IPA. As I mentioned earlier, these aren’t the craft brews Aleheads are used to drinking – you won’t be seeing any hop bombs or imperial stouts coming out of Cavalry. 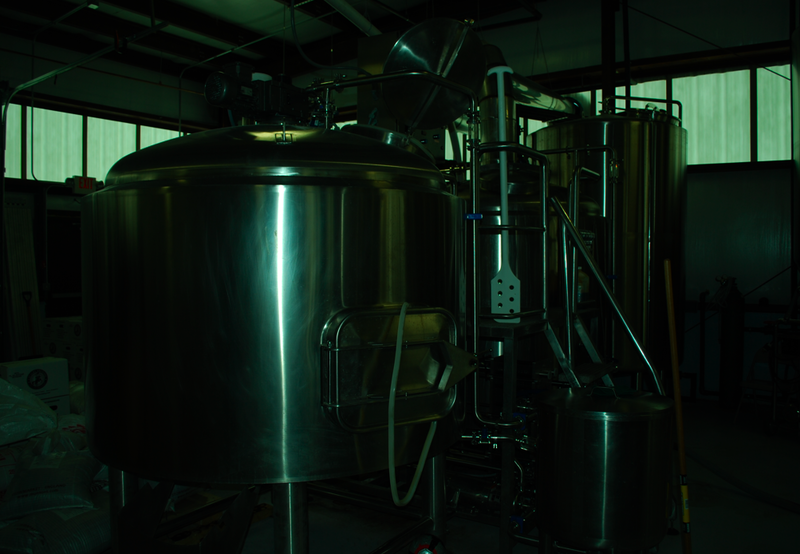 What you will see are well made and highly drinkable session beers – something I can live with! Unfortunately, Cavalry only distributes within Connecticut for now. Having said that, there’s a big need for craft brewers in the Nutmeg state – we only have 5 breweries right now. And if you ask me, Cavalry is just getting started. Mike mentioned that he had just entered one of his beers in a competition for the first time (“I’ve never bought a beer because it won an award”), but I hope if he does well we’ll see more offerings from him. Mike also showed me his personal stash – a walk in fridge full of cask conditioning versions of his beers. He says he’s going to be starting “Cask Wednesdays” where they’ll tap a cask and open up the brewery to all comers after work. I’ll be there, Mike, you keep making the great beer. Posted in Ale Factories, Alehouses, Beer Marketing.Tagged Bitter, Cavalry, Local Beers, Porter, Session Beers, Stout. Great post, love hearing the stories behind these little breweries. I enjoyed it as well–more and more I find myself realizing just how many breweries there are in this country, and how many more there will be in the near future. It’s really an endless bounty. None of us will ever be able to have them all. Thanks! It’s interesting how people with such different world views can find common ground sometimes. It’s really great how people in the industry really support each other too – very different than other industries. Kid, we can’t try them all – but we sure can get drunk trying.